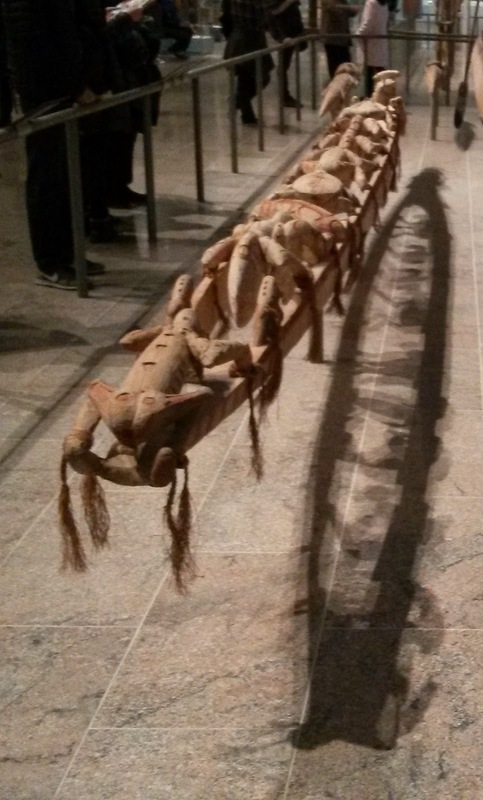 "Asmat spirit canoes (wuramon) are ceremonial carvings in the form of supernatural vessels. Wuramon are created for a one-time use during emak cem (the bone house feast), a ceremony that celebrates the spirits of the recently dead and the initiation of young boys. 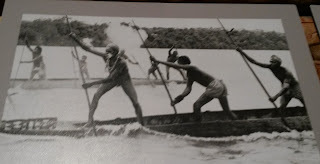 After being secluded within a ritual house for several months, the boys emerge one by one and crawl across the wuramon on their bellies. As each crosses the vessel, he is transformed from a boy into a man. Once across, he is seized by a man who cuts designs into his body; these heal into permanent scarification patterns that mark him as an adult. 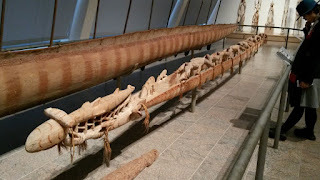 "Crewed by spirits, the wuramon has no bottom to its hull, as spirits do not require a complete hull for their journey. 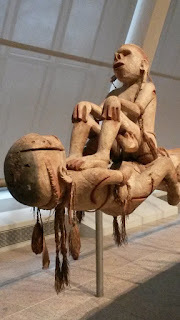 The spirit figures have a dual nature: their outer forms portray supernatural creatures, but each is named for a specific recently deceased ancestor, whose spirit it embodies. A turtle (mbu), a fertility symbol because of the numerous eggs it lays, appears near the center of this wuramon. Behind it is an okom, a dangerous Z-shaped water spirit. The other figures, gazing down through the bottomless hull, represent menacing water spirits (ambirak) or human-like spirits (etsjo). 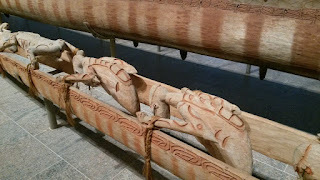 A hammerhead shark is depicted on the prow." 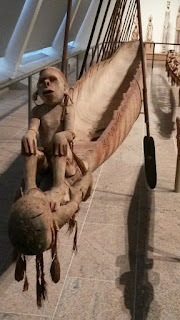 Asmat spirit canoe (wuramon), with hammerhead shark figure at the bow (left). Click any image to enlarge. 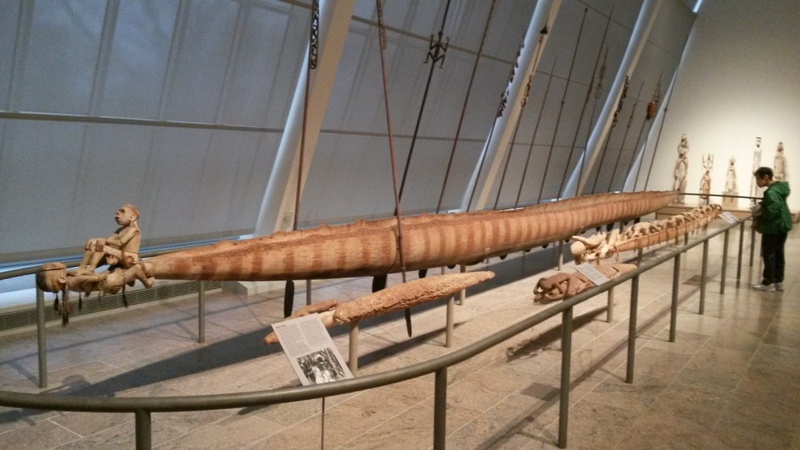 Asmat spirit canoe (wuramon) at Metropolitan Museum of Art. The spirit figures are lashed to the gunwales. Spirit figures looking down through bottom of hull. The gunwale displays a fine pattern on the outer surface. 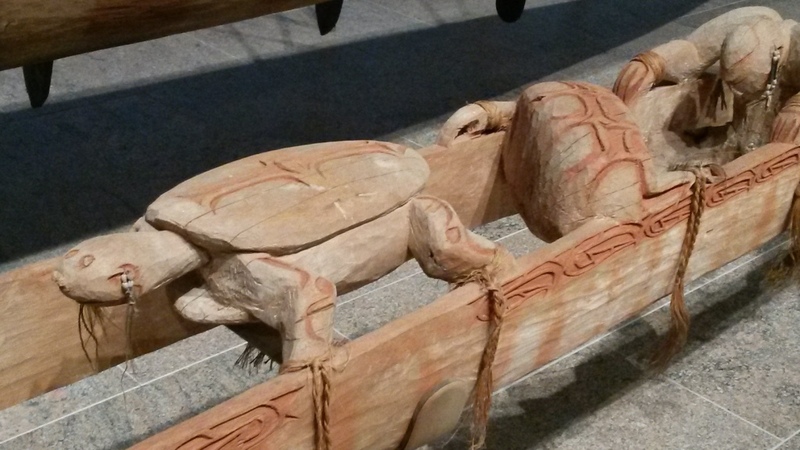 The turtle spirit figure symbolizes fertility. Behind it is an okom, "a dangerous Z-shaped water spirit." More spirit figures looking through the bottom of the hull. 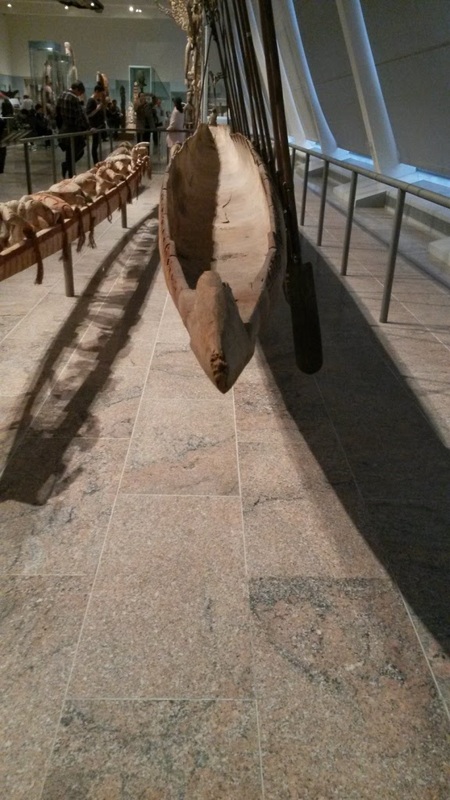 Behind the spirit canoe is the large dugout canoe featured in the previous post. 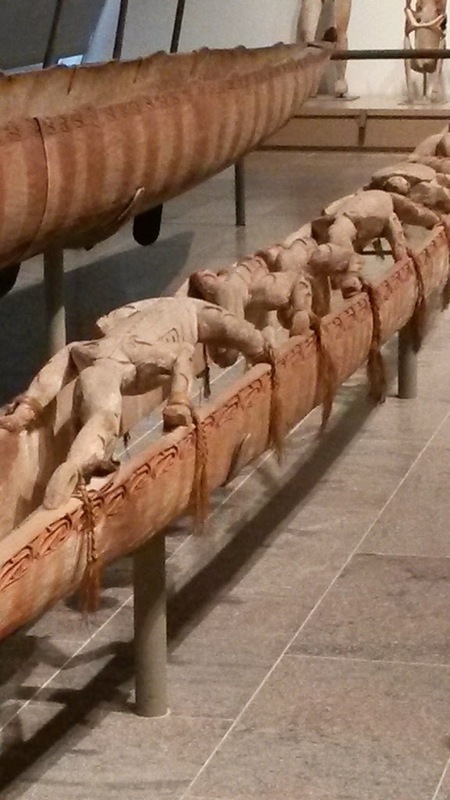 Note the fine decorative carving on the gunwale, similar to that on the wuramon. 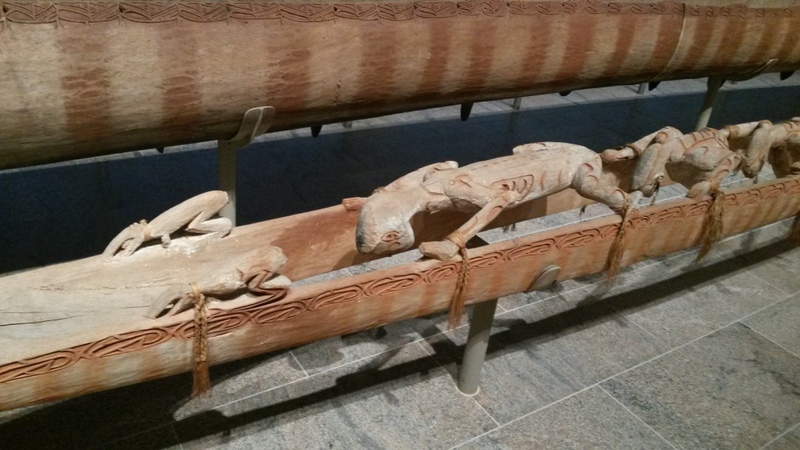 "All large Asmat canoes have carved prows, and those of large communal canoes, such as the present one, are especially ornate, adorned with images of ancestors and headhunting symbols. 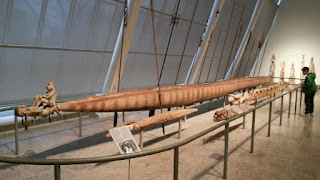 Nearly fifty feet long and capable of carrying twenty people, this canoe was carved by the master woodcarver Chinasapitch of Per village, assisted by other men. 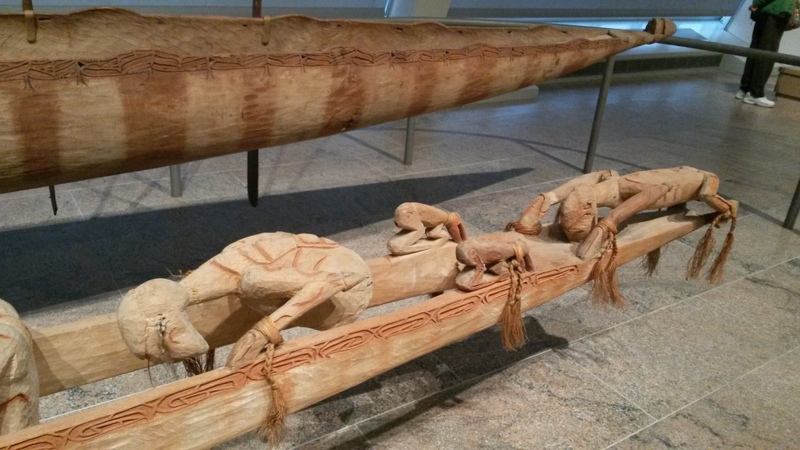 The seated figure on the prow depicts his deceased sister Banditis, while the reclining figure represents a young man who had recently been killed by members of an enemy village." Asmat canoe from the bow. Paddles leaning on both sides have very long shafts without end grips. 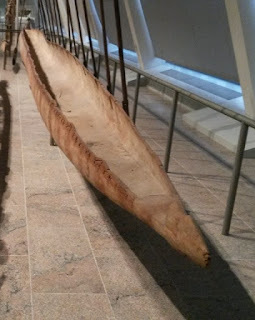 The blades, which are lashed with fiber (presumably vegetable) to the shafts, are rounded at the bottom and square-shouldered at the top. Below, is an image from Wikipedia's article on the Asmat people, showing the prevalence of dugout canoes in the culture in 1912 or 1913. 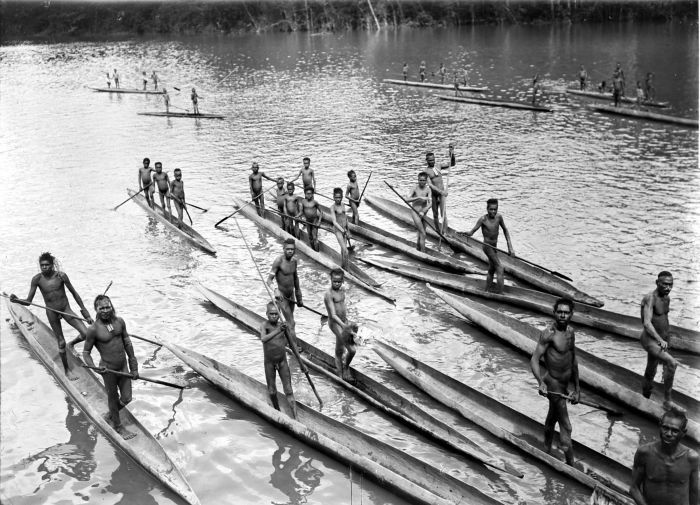 Asmat men and boys in dugout canoes, 1912 or 1913.